Blogs are dime a dozen. Only a small percentage of bloggers are good enough to stand out. In the following interview Debt Roundup CEO, Grayson Bell shares with the Success Harbor audience what it takes to create a blog that performs ahead of the competition. Grayson started out sharing his story of getting out of personal debt. What started out as a hobby turned into a business. How to start a blog? 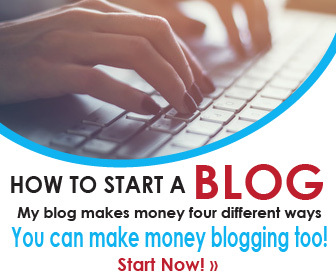 Do you want to start making money as a blogger? Read my free step-by-step guide on how to start a blog. The key to being different. How to differentiate your blog from the rest? What should bloggers focus on, especially in the beginning? You will learn how Grayson spends his time as a professional blogger. Success Harbor: What were your goals when you have created Debt Roundup in 2012? Grayson Bell: Back in 2012, I was just getting out of a large amount of debt. I had just paid off over $75,000 of consumer debt, most of which was credit card debt. I wanted to share my story with others dealing with the same situation. While I had been blogging on the WordPress platform since 2004, I wanted to start a personal finance site and share my journey. There weren’t many goals attached to my vision. I wanted to just share and grow the audience to help others get out of debt. Success Harbor: What entrepreneurial experience have you had prior to starting Debt Roundup? Grayson Bell: Prior to blogging, I started and ran an Ecommerce company selling consumer electronics online. I ran the company for four years before I ended up shutting it down in 2008. The company generated over $1 million in revenues in the last year, but the work was tough, the margins thin, and it was affecting my health in a negative way. It was great experience for me with regards to starting and running a business. Much of my debt was generated from this business. Success Harbor: What recommendations would you have for someone who is starting a blog today? What should they spend their time on, especially during the first year? Grayson Bell: If you want to start a blog, pick a topic you’re both knowledgeable in, as well as something you have passion for. Don’t chase the opportunity to make money in this space. If you chase the money, you will fail. Blogging takes a lot of time and energy, especially to build up your audience. If you don’t have passion, you will not get very far. My blog didn’t grow much during the first few months until I started networking with other bloggers in my niche. Personal finance bloggers are very helpful toward one another. We try our hardest to make sure you have the information you need. We don’t view each other as competitors like some blogging niches. You really need to connect with them on social media, comment on their work, and share it. Bloggers typically will reciprocate and share your information. This is how you grow. Also, make sure to not focus on stats. They are meaningless in the beginning. Don’t focus on your visitor count. Take time to create awesome content and connect with others in the same niche. That’s what every blogger should focus on. Success Harbor: What advice do you have for bloggers who are struggling to differentiate from the competition? Grayson Bell: Blogs are a dime a dozen. There are so many started each and every day. It can be hard to break out with all the “noise,” but it can be done. The key to being different is by sharing your personal experiences with your audience. No one knows you better than you. Don’t be generic, be personable. Readers want to relate to you on a personal level and when they do, they will continue to come back and share your work. Make sure to never focus on what your “competition” is doing. If you see them making “x” each month, you will put yourself down and get upset that you’re not making the same amount. It can be hard not to do this, but it’s doing yourself a disservice. Do what you’re comfortable with and what you know. When you try to emulate, you can end up making it worse. Grayson Bell: I try my hardest to diversify my traffic. I write about current events while adding in my own personal opinion or touch. I focus on social media, especially Pinterest. Pinterest traffic is really good and it’s much easier to get than search. A good way to get your blog out there is to try and guest post on bigger blogs. Just try to reach out to them asking if you can guest post. Many will let you do it and then you can get a link back and possibly traffic to your site. This will just get better as you do more and more. You should also work on creating an email list right from the beginning. You might hear “the money is in the list” type saying and it can be true. Your email subscribers are targeted and want to hear more from you. Utilize them to build traffic. Success Harbor: How do you monetize your blog? Grayson Bell: My blog is monetized in a few different ways. I have ads on the site, which produces income as people come and interact with them. My main source of revenue is through affiliate relationships. I get paid when someone buys or tries a service I might be talking about. Affiliate marketing can be difficult, but also lucrative if you do it right. You have to know your audience and not inundate them with affiliate offers too often. It can be irritating. I also make money by working with brands and big companies with sponsored content. This is where I will write something for the company describing my experience or thoughts on their product/service. These are paid opportunities, but also I notify my readers that compensation was provided. Success Harbor: What blog promotion tactics, tools or sites have helped you make your blog a success? Grayson Bell: Some of the most successful blog promotion tactics are revolving around social media. The environment is built for sharing good content. I use services like Buffer and IFTTT to build in some automation into the sharing process. I use TweetDeck to run multiple Twitter accounts. I pay for promotion on Pinterest with their ads program as well as Facebook. This is a good way to get traffic to your posts. Social media is one of the promotion methods that can be almost instant compared to working your post toward search traffic. Some have had luck with Reddit, but you have to be very careful in how you share and what sub-reddit you’re a part of. They will ban you if you don’t follow the rules. I’ve started using a headline analyzer by CoSchedule, which helps me come up with good headlines – http://coschedule.com/ headline-analyzer#. Blog promotion also does well when you have excellent images on your site. I’ve used Pixabay, but now I use DepositPhotos to get images I need for my posts and social media. Grayson Bell: My time is mainly spent on creating content and marketing posts. I do have a staff writer that creates some content for the site, but I create all the other parts. I take time to test article titles and even images. There is a lot of time put into writing content, sourcing images, and promoting on social media. Creating your content is only about 30% off the work. Where your time gets taken away is in the promotion. You have to constantly promote your work and share it. It’s the only way to stay relevant. Success Harbor: What are your goals for Debt Roundup in the next year? Grayson Bell: My main goal is to continue to grow the audience for Debt Roundup. I want to grow the traffic to the site and allow it to have more residual advertising revenues. I’d also like to produce longer “guide style” articles to help people with different aspects of money. Grayson Bell: The biggest factor about becoming a professional blogger is you need to understand how much work it is. There are so many courses out there showing you how awesome blogging is, but this can be more than a full-time job. It’s a massive time commitment and most bloggers get burnt out within the first 6 months and quit. If you want to succeed, you need to create a plan for your blog. What do you want it to achieve in the first month? First 6 months? First year? Create a posting schedule you can keep up with on an ongoing basis. If you want to post everyday, you will be tired of it quickly. Pick something like two or three days a week. That is much more sustainable than every day. If you don’t use your blog as a marketing tool for something else, you might have a hard time cutting it. Most bloggers turn to other services as a way to expand their income. You could offer services (like I do) or create books, courses, or even start freelance writing for other sites. Use your blog for advertising you. Grayson Bell: People can find out more about me at http://www.debtroundup.com/ about/ or they can contact me on Facebook, Twitter, Pinterest, and many other social networks.